“Prepare to be dazzled” greeted a cheerful attendee at the unveiling of Sir Peter Blake’s Everybody Razzle Dazzle today in Liverpool, and he wasn’t wrong. Despite the slightly nauseous feeling that accompanies the smell of fresh paint and the motion of the waves, this is perfect public art: interactive, joyous and ever-so-slightly bonkers. The third in a series of ‘dazzle ship’ commissions by Liverpool Biennial, 14-18 NOW and Tate Liverpool, pop art legend Sir Peter Blake seems to be the ideal artist to redesign Mersey Ferry ‘Snowdrop’ in his inimitable style — not least because of his obvious connections to the city through his creation of the Sgt. Pepper record cover. 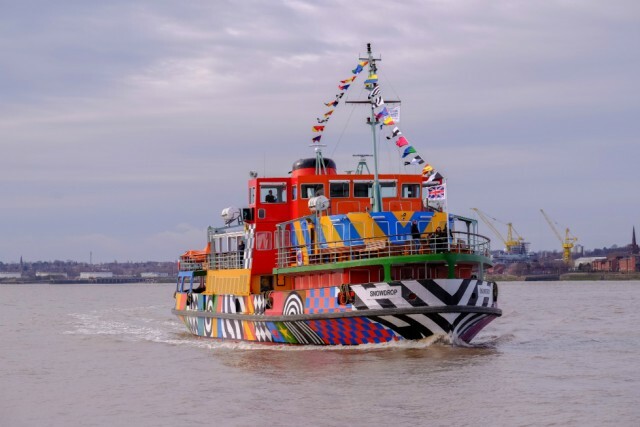 The only one of the dazzle ships to be used as a working vessel, the ferry is a veritable collage of psychedelic pattern; you can’t miss the streak of vivid colour and striking monochrome as it darts across the Mersey. It even looks — as witnesses said today — like it’s sailing faster than usual. Watching this moving artwork on the water, it is easy to see why the dazzle technique became an unlikely form of camouflage during the First World War that sought to baffle the eye and make the duty of judging distance, speed and direction for enemy U-boats and aircraft a more than tricky task. 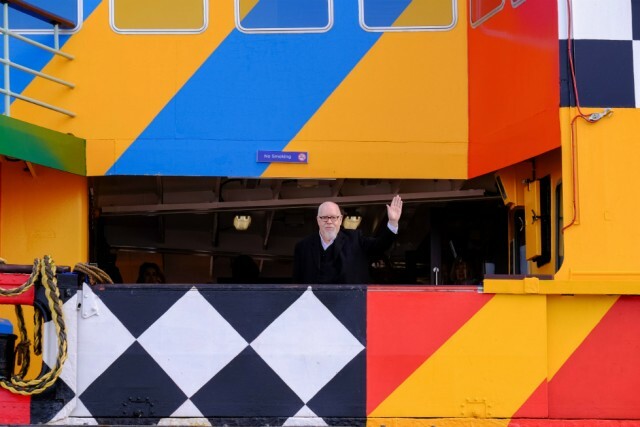 No stranger to using transportation as a mode of artistic expression, Sir Peter Blake’s last expedition to Liverpool was in 2013 with a travelling double-decker Art Bus, promoting the work of some of Britain’s most exciting contemporary artists. 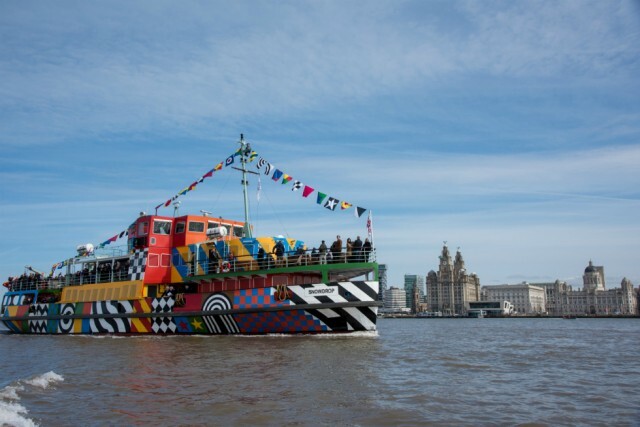 While the Art Bus primarily functioned as a mobile gallery, the dazzle ferry IS the artwork. 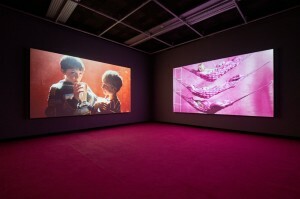 With this in mind, Everybody Razzle Dazzle becomes a participatory experience, an invitation to visitors to look harder at their surroundings and explore the artwork both inside and out. Clever design features reference International Maritime Signalling in the form of flags; draped along the length of the ferry, each flag holds a pattern that represents a letter of the alphabet, thereby allowing words and communications to be formed through varying combinations. For those that seek more than an impressive exterior, the dazzle ferry hosts a breezy display of information, curated by National Museums Liverpool, for visitors to engage with and, as director of 14-18 NOW Jenny Waldman states, “learn more about the rich maritime history of Liverpool and the Mersey Ferries during the First World War”. 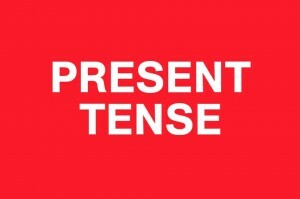 And this is exactly what it does. 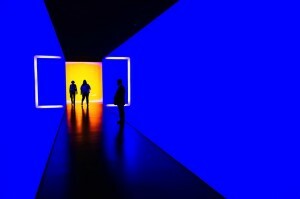 It brings history out of the textbooks and museum spaces and into a technicolour present, demonstrating the unlikely role of art and design in modern warfare. Artwork during WW1 often sought to express the horrors and catastrophe of the war: here, we become aware of how it became a necessary and functional tool utilised to mislead and baffle the enemy. 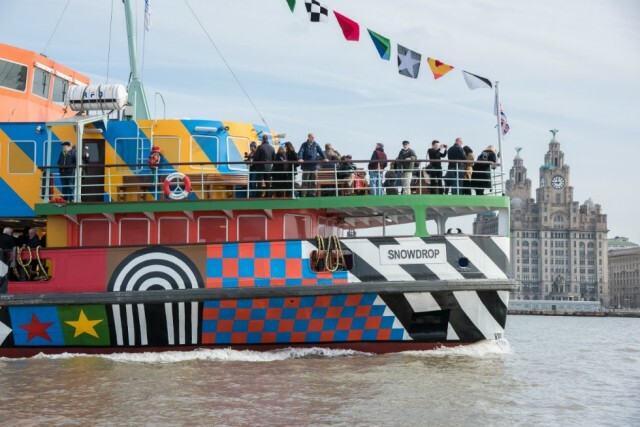 With a planned stay of two years and a full roster of events, Everybody Razzle Dazzle forms a visually stimulating way into Liverpool’s Maritime History, yes; but it’s also a live, sailing showcase of Blake’s fantastic ability as a designer and artist.